"We protect the rights of our clients" - said KVZ Digital Ltd. 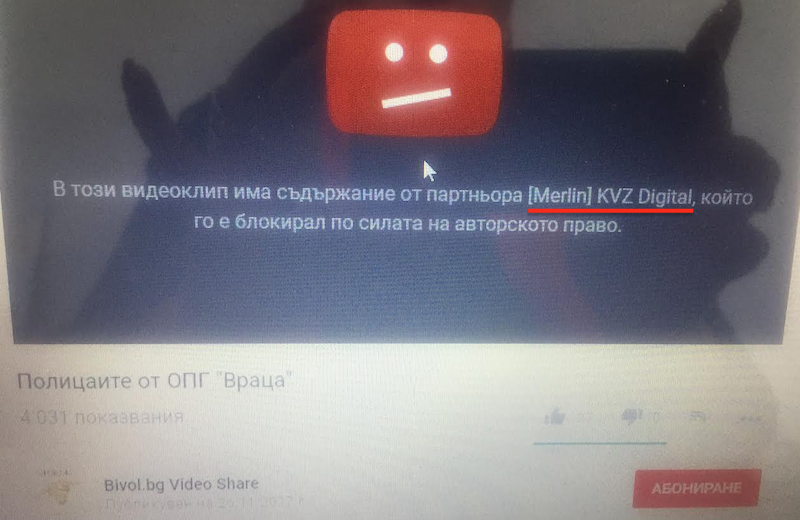 The Vienna-based company with Bulgarian participation KVZ Digital Ltd. regularly blocks YouTube videos on grounds of copyright infringement. However, investigative reporting outlets, are among the blocked as well. They don’t use copyrighted material, but are often criticising their countries’ governments. Curiously, KVZ Digital Ltd. develop their tracking and blocking system with EU funds, Bivol’s reporters found. Two days ago, a video by Bivol, showing the warm relationship between policemen and local gangsters, was blocked. After a quick reaction of our editors and a brief brawl on the phone with the head of the company, Kiril Zdravkov, the video was restored. Today, however, a new incident occured: KVZ blocked a video from the Serbian KRIK.rs investigative website. The video shows footage of police crackdown on a drug lab, disseminated by Serbian police to the media. Obviously, such a content cannot be subject of copyright. KRIK founder Stevan Dojcinovic told Bivol that this incident is not the first one experienced by their media. Over the past year, KVZ has blocked many of their clips, as well as other media clips, critical to Serbian government. Saska Tsvetkovska, a leading investigating journalist from Macedonia, has also complained of the same practices. Both journalists are OCCRP partners and have strong records exposing corruption and governmental abuses in their countries. Because of their work, they have been identified as “enemies of the State” under different governments, targeted by trolls and smeared by pro-government propaganda. Approached for comment, KVZ Digital Director, Kiril Zdravkov, did not agree that his company is dealing with censorship. According to him, KVZ contributes to copyright protection. Asked why KVZ violates the rights of third parties while protecting their clients’ rights, Zdravkov replied that it was a customer-induced incident. “Under the contracts they have signed, for any potential glitches that happen if they use the system that we have given them – the responsibility is borne by the customers,” explained Zdravkov. Removing YouTube recordings over copyright infringement is based on reports to Google’s Content ID and is part of the services KVZ offers to its customers through YouTube content monetization packages. These include televisions (Bulgarian bTV and Serbian RTS), producers and more or less well-known music authors. It is interesting to find out whether, if someone becomes client of the company, they would also be exposed to reporting and blocking on behalf of other clients. Unfortunately, our media does not have the money to test how the system works from a customer perspective. Advancing censorship with EU funds? This year, the Bulgarian branch of KVZ has won a European project under the “Competitiveness Program” for “Improving Production Capacity in KVZ MUSIC EOOD”. The grant of BGN 101,500.00 (about EUR 50,000) is to be used to “deliver, install and deploy software for unified and improved processing and distribution of audio and image files and related metadata”. This software should automate the process of processing and converting copyright and intellectual property metadata, as well as the process of tracking the distribution of distribution packages and their rights. Automation must lead to “a reduction in the time it takes to deliver 50% faster services”. But alongside the accelerated tracking and sanctioning of copyright offenders, innocent and well-intentioned small media will suffer. There is some inexplicable coincidence as those media publish fact unpleasant for local governments. Thus, the removal of investigative stories that have the potential to cause headaches to the authorities becomes a very easy task for major state media, such as the Serbian RTS, for example. It is enough to pay the KVZ subscription and use their reporting system to do “the dirty work” without knowing who is responsible and guilty of what has happened. In case of a serious investigative story, timing of distribution is an important factor. The rapid blocking of critical content can affect civilian and political processes that develop in minutes and hours. And the KVZ system, improved with European money, is obviously speeding things up. Google’s own algorithm, which is designed to protect large corporations under the proverbial Wild West rule “shoot first ask questions later”, is also a problem. Affected third parties suffer damages, but there is no compensation for them. Once they fall victim to the wrong system, they are forced to waste time to challenge the unfair punishment by filling out a claim to Youtube, or to the KVZ brokerage firm. But as mentioned above, KVZ denies any responsibility. Brussels said this week it was preparing regulations for Internet giants. It will be also good to subject these controversial practices to an assessment of compatibility with European acquis communautaire. And, of course, funding new tools for improving and advancing censorship with European taxpayers’ money should be discontinued.